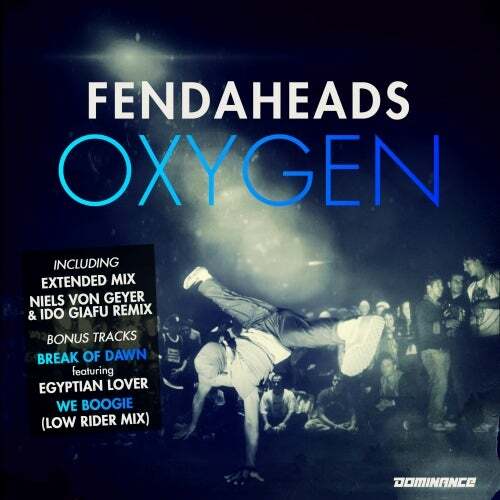 Fendaheads aka DJ Derezon and Hound Dogg Harris from Berlin are back with their new single "Oxygen". The catchy Electrofunk hit is taken from the Fendaheads album "Overload" and Dominance Electricity's "Electrofunk Resistance" compilation. Next to the original, two alternativ mixes and the House remix by Niels Von Geyer & Ido Giafudrei, this single EP also includes the new ElectroBass bonus track "Break Of Dawn" featuring 80s Electro legende The Egyptian Lover as well as an 808 bass loaded Low Rider remix of "We Boogie".